Nikon has finally introduced its much awaited line of mirrorless cameras … compact digital cameras with interchangeable lenses. The Nikon 1 series includes the more upscale model V1 and this introductory level model the J1. For your very mobile lifestyle comes a completely new imaging system with freedom to create and express as never before. 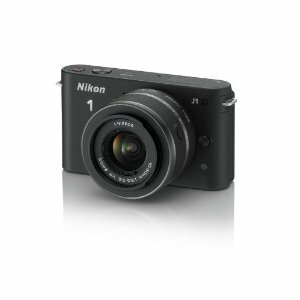 Highly compact and portable, the Nikon 1 J1 goes everywhere you go. Moments from your amazing world are captured using a highly responsive autofocus and super fast shooting speed. In one touch you can work in Full HD (1080p) movie record mode. A camera so versatile you can even snap photos while recording movies. Unleash your creativity with Nikon 1—offering a balance of high performance, advanced features, portability and a newly designed interchangeable lens system. Infuse your world with photos from every moment and connect as never before. Today, all it takes is a single imaging device to capture and share every moment of an incredible and connected life. Nikon brings an evolution in imaging technology, starting with a newly developed Nikon CX-format super high-speed AF CMOS sensor that powers every capture. Ensure image precision through the new, compact interchangeable lens system featuring image stabilization (VR) and superior fast and quiet autofocus motors built on the NIKKOR heritage of optical excellence. Nikon also boasts that the J1 auto focus is “as fast as you are” with an impressive 10 fps speed in auto focus mode. This compact little camera features full HD video at 1080p and it also allows you to snap a still photo while recording your video. Expand creativity and select from a range of lens options, including one designed specifically for movie filming. Engineered for fast and easy swap-out, stay photo-ready all the time. 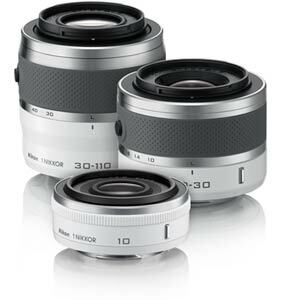 Compactness brings portability, whether using the single focal length 10mm or the 30-110mm telephoto. 1 NIKKOR lenses feature vibration reduction (VR) to keep photos sharp, extending a heritage of precision symbolized by durability, superior image quality and optical excellence. The Nikon 1 J1 is a good camera in a lot of ways. Great image and video quality and some solid optics make it easy to give it a favorable review, but it’s not a must-have for enthusiasts and Nikon fans. The J1 is the entry-level camera while the V1 contains a few extra features such as electronic viewfinder (EVF), higher dot composition LCD monitor and an i-TTL sensor that can accommodate an optional external flash unit. Outwardly, the cameras appear very similar with the V1 being differentiated by a hump on the top of the body housing the EVF and a small ridge on the right front to afford a better grip. Internally, the image capture hardware is identical: a 10.1 megapixel resolution CMOS sensor measuring 13.2 x 8.8mm, designated as “CX” in Nikon terminology and providing a 2.7x crop factor. Nikon’s new EXPEED 3 image processing engine drives the system and reportedly provides rapid response, fast AF and high-speed performance. In addition, the new dual core EXPEED 3 processor works to maximize battery >efficiency while providing high-speed processing and faster transfer rates. Both cameras feature a new AF system that, according to Nikon, provides “…incredibly fast, split-second response.” Nikon goes on to describe it as a “…newly developed hybrid system that continuously evaluates the scene at hand for optimal results, and can switch between phase detection and contrast detect AF to best suit the scene.” Nikon claims this new system is the “world’s fastest autofocus,” albeit under a set of conditions that we will discuss later. The nominal continuous high-speed shooting rate is 5 frames per second (fps) at full resolution, but the electronic shutter offers 10, 30, or 60 fps rates at full resolution as well. The camera can capture still images in JPEG, NEF (RAW) or NEF/JPEG combinations. Full HD video can be captured at 30 or 60 fps, and there are rates of 400 and 1200 fps for slow motion work. 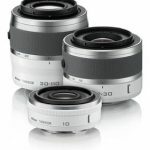 ISO ranges from 100 to 3200, with a 6400 setting available. If you’re looking for an introductory model camera in the mirrorless interchangeable lenses category, and you are a fan of Nikon cameras, then the Nikon 1 J1 is worth looking at. It’s full HD video capacity along with being able to shoot stills while video recording could make this a good choice for those folks who like shooting their kids’ soccer games … or any other similar sporting events that happen so fast you can easily miss the best shots. Again, remember to check out our Series of Tips for Buying Digital Cameras for some good ways to narrow your choices to make sure you get the right camera for your kind of photography.